NEW YORK, Oct. 1, 2018 /PRNewswire/ -- Garrett Motion Inc. (NYSE: GTX), a cutting-edge technology provider that enables vehicles to become safer, more connected, efficient and environmentally friendly, today marks its first day as an independent company following its successful tax-free spinoff from Honeywell. 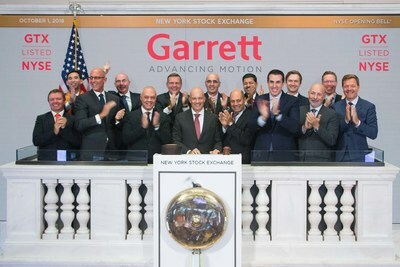 Garrett CEO and President Olivier Rabiller led Garrett's executive leadership team in marking a new era in the more than 60-year history of the company by ringing the opening bell above the trading floor at the New York Stock Exchange. "This is a memorable milestone for a company that already celebrates more than six decades as an automotive technology pioneer, inventor and innovator," Rabiller said. "We have a robust and talented organization of world-class people, and we have established a strong position for providing differentiated technologies that are in demand. "In leveraging our rich heritage as Honeywell Transportation Systems, we have evolved Garrett into a new dynamic and forward-thinking company. The Garrett name has been synonymous with advancing motion by revolutionizing turbocharger technology that has become foundational to modern internal combustion engines. Now, as an independent company, Garrett will vigorously pursue opportunities to provide electric boosting and automotive software solutions addressing global macro issues, including more stringent fuel economy regulations and increased connectivity, which are heavily driving future vehicle development." In addition to its original equipment manufacturer (OEM) customers, Garrett also provides replacement parts to the global independent aftermarket meeting a range of end-customer needs. Garrett is also a legendary turbo brand within the performance and enthusiast community. Its aftermarket performance portfolio serves OEM factory teams competing at the highest levels of international competition as well as private grassroots racers and tuners seeking improved engine performance. Garrett enjoys longstanding collaborative relationships with leading global automakers and has a proven track record of operational excellence. It currently serves approximately 40 global automakers with 13 well-positioned manufacturing plants and five research and development centers to meet worldwide demand. Garrett has more than 7,500 employees including some 1,200 engineers contributing to 1,400 issued or pending patents. In 2017, Garrett revenues were approximately $3.1 billion. More information on Garrett is available on its new website at http://www.garrettmotion.com. Garrett (www.garrettmotion.com) is a differentiated technology leader, serving customers worldwide for more than 65 years. Garrett's cutting-edge technology enables vehicles to become safer, and more connected, efficient and environmentally friendly. Our portfolio of turbocharging, electric boosting and automotive software solutions empowers the transportation industry to redefine and further advance motion. 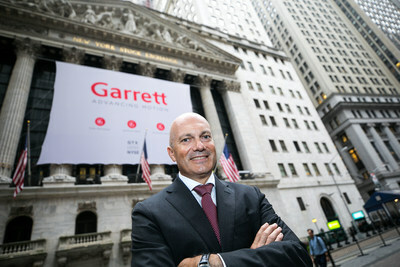 For more news and information on Garrett, please visit www.garrettmotion.com/news.